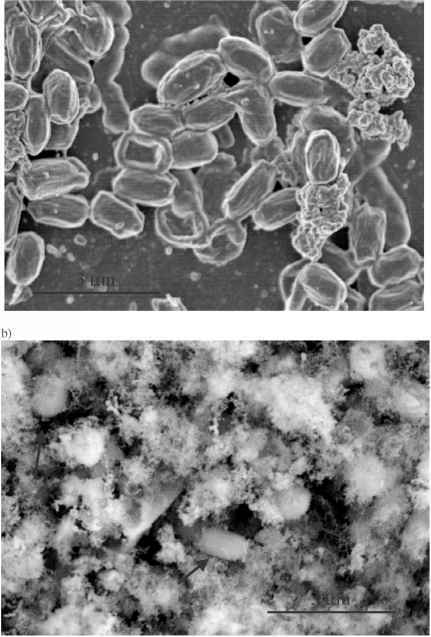 FIGURE 13.2 SEM images with concomitant EDX analysis of crystals observed in powdered weaponized bacterial spore surrogates. Powders were dusted onto a silicon substrate; no coatings were applied to the samples. 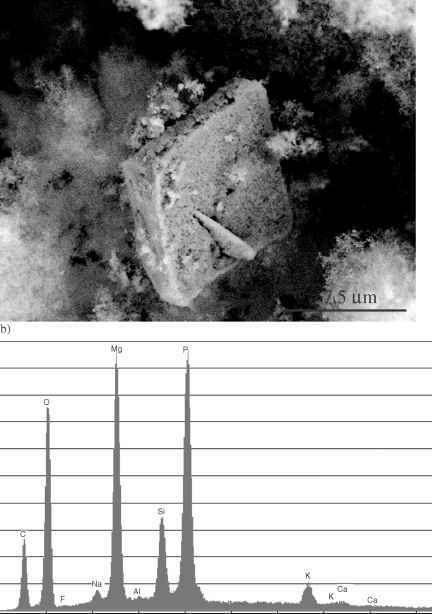 (a) A micrograph of a microcrystal found in samples grown in media containing large quantities of magnesium and phosphate. The crystals are ~10 ||m x 10 ||m x 2 ||m. (b) Elemental composition of the same crystal shown in (a), as measured by EDX analysis results in large magnesium and phosphorus peaks. (c) Octahedral protein toxin crystals (indicated by the arrows), generated by Bacillus thuringiensis, are ~1 ||m in length. B. thuringiensis spores are also seen in the micrograph. (d) EDX analysis of the protein toxins seen in (c) shows the particle to be organic, containing only carbon, nitrogen, and oxygen. The silicon peak is due to the substrate.